What was the weather like in the Eocene? I was reading this question earlier today. It asks about the characteristics of global winds in a modern-day earth with Eocene-like temperatures. I'm here to ask about other kinds of weather in the Eocene. The only hard estimates of temperature for the Eocene I could find online are here. Based on these numbers, let's assume a yearly average of about 24 °C or 75 °F, with averages in the summer being 28 °C (82 °F) and the winter averaging at 20 °C (68 °F). These readings are taken in "the US Gulf Coast," so let's assume these temperatures are representative of 30 °N. Based on this data, what weather may have occurred in the Eocene that would affect a human population? I've researched this a bunch, but I'm not grasping what this data says about the climate of the world as a whole, different areas of the world, or the weather. My main concern here is determining whether severe weather or even mild precipitation would be as common as, less common than, or more common than they are today. My story is about humans living about 50 mya, so I'm trying to establish a setting that's as reflective of real-world conditions at that time as is possible. Hurricanes, wind, and any other significant aspects of the weather are also relevant. The other thing I've found researching this is that no-one in the scientific community wants to publicly give actual numbers. Given that I'm openly asking for speculation as to what may have been based on a small amount of data, I figured Worldbuilding is the best place for this question. If you think a site that values facts and hard data above all would accept this question better than Worldbuilding, feel free to send me there. If this is too broad, I can easily narrow it. You are asking about Palaeoclimatology. Please take everything I say as speculative. The Eocene Epoch was 56 to 33.9 mya (~22 million year time period). It is typically split into three subdivisions; early, middle, late. It starts off with one of the warmest periods in Earth's History. Then a cooling period begins and Ice slowly starts to reappear at the poles and then finally we have the rapid expansion of the Antarctic Ice Sheet (from Wikipedia). TL:DR Initially, it was warmer than the present, with a lot more precipitation. Little to no high latitude Polar ice. Little seasonal or latitudinal variation in temperature, hardly any frost. Winds would not have been very strong, as little to no strong pressure gradients. Later it started getting cooler. More variation in seasonal extremes as well as by latitude. Strong winds, snow, and frost would have been more frequent during Winter. Sea Levels would have dropped and the air would have generally been drier. Larger weather features would start to form as the Atmospheric Hedley/Ferrel cells strengthened and started stabilizing. Distinct climates and biomes would develop. During this time, there is little to no Ice on the planet. There is little difference in temperature between the Equator and Poles. Temperatures are much warmer than today, swamps and forests are spread over most of the landmasses including the higher latitudes. This spread of forests and even palm trees to the higher latitudes is possible due to the fact that there are more greenhouse gases in the atmosphere than present (CO2 and methane). More methane was released from the swamps and wetlands etc creating positive feedback loops. It is also, due to the fact that the Drake and Tasman Passages are closed, allowing the polar waters to mix with the warmer equatorial waters. A) Global distribution of the marine basin during the Eocene (56–33.9 Ma. ), illustrating the closing and opening of the main gateways, which have determined drastic changes in the deep-water circulation. 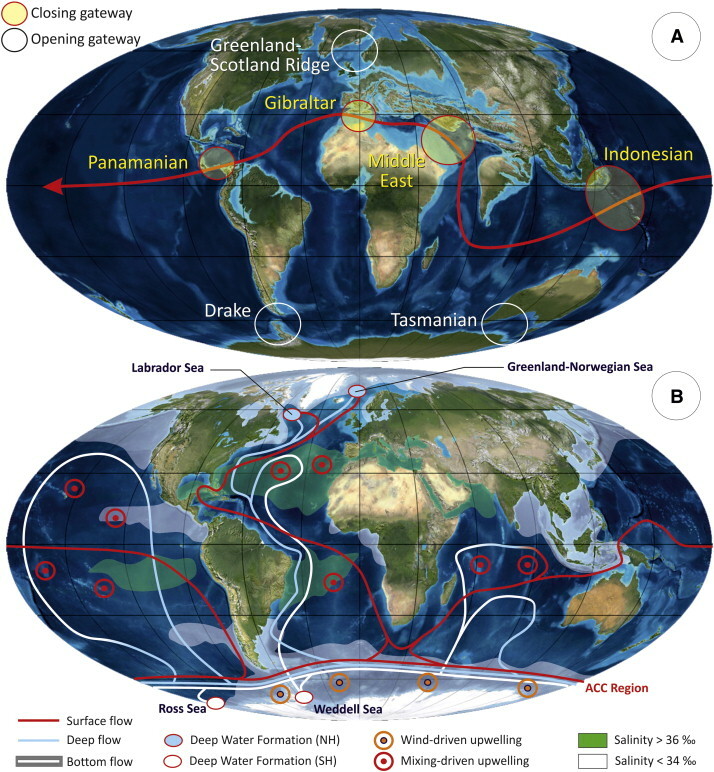 B) Global thermohaline circulation. Red: surface currents; Light blue: deep water; White: bottom water; Orange: main sites of deep-water formation. In the Atlantic, warm and saline waters flow northward from the Southern Ocean into the Labrador and Nordic seas. In contrast, there is no deep-water formation in the North Pacific, whose surface waters are consequently fresher. Deep waters formed in the Southern Ocean become denser than those from the North Atlantic and therefore spread at deeper levels. Note the small, localised deep-water formation areas in comparison to the widespread zones of mixing-driven upwelling. Wind-driven upwelling occurs along the Antarctic Circumpolar Current. The article you linked to in your question is talking about the discrepancy between the data obtained from various locations and the predictions derived from models. Currently, the models are saying the poles should have been a lot colder than what our records are showing. It's known as the "equable climate problem". There are several competing theories as to how to solve this, but no-one has solved the issue yet. This equable warm temperature in the Arctic allowed a floating aquatic fern (Azolla) to flourish! When the temperatures started to cool, the Azolla fairly rapidly (geologically speaking), sank to the bottom of the sea and sequestered a lot of CO2, allowing for further temperature changes. This is known as the Azolla event, although it's not sure if it was the trigger or just helped with the drawdown of the CO2. This equable and homogeneous temperature range over the planet would have affected the atmospheric circulation system. One of the papers linked in the accepted answer to the question you linked to (shew, what a mouthful), discussed the effect on the Hadley, Ferrel and Polar atmospheric cells. The paper estimates the winds and precipitation during this time. The ice-free state during LPTM was characterized by a much higher annual-mean temperature and a greatly reduced seasonal cycle along with a lower equator-to-pole surface temperature gradient than is known for any other period in the Cenozoic for which data exist. In the Huber & Sloan (1999) simulation of the LPTM climate conditions, the surface winds for January (Fig. 8A) presented mid-high latitude easterlies centered on 50° to 60°S and a weak westerly wind belt around 30°S. The presence of mid-high latitude easterlies is not the result of an expansion of the tropical easterlies so much as an expansion of the polar easterlies. This wind scenario, characterized by relatively strong easterlies over Patagonia and a weakened wind system over the Pacific Ocean likely generated air mass advection from the Atlantic inducing convection and precipitation over land. Such conditions are consistent with the suggested rich subtropical vegetation that existed over a large portion of Eocene Patagonia with the presence of megathermal families such as palms, other taxa with broader climatic requirements such as conifers, cycads, and Ginkgoales (Wilf et al., 2005; Iglesias, Artabe & Morel, 2011; Quattrocchio et al., 2011), as well as the coals in the east Patagonia (Scotese, 2010). The strong high latitude precipitation in the model scenarios (not shown) was a reflection of the warm high latitude SSTs, as a result of the fact that the removed seasonal sea-ice from the polar seas enhanced local evaporation and precipitation. The reversal of the ‘polar cell’ caused by the deep high latitude convection is a fundamental disruption of the normal atmospheric general circulation. During winter time (Fig. 8B), the winds display the same easterlies pattern over Patagonia but weaker than in summer. This marks the change to the cooling Middle and Late Eocene. As the Drake and Tasman Passage started to open up (order still undetermined), the polar waters became isolated from the warm equatorial waters. No more mixing was taking place and the antarctic circumpolar polar was formed. This isolated and unmixed cold water allowed the temperature to drop several degrees and for Ice to slowly start forming at the poles. There was a brief rewarming of the Earth for about 600 000 years. This reversal from the cooling process that had been started is attributed to India colliding with Asia and forming the Himalayas. So temperatures would have fluctuated at this time, I think while warmer again, there was also a larger seasonal variation. This seasonal fluctuation would have affected those species (plant and animal) that couldn't cope with large temperature and precipitation ranges. After this brief hiatus, the cooling continued until the end of the Eocene and beginning of the Oligocene. Cooler temperatures, the raising of the Andes Mountains 45mya (which interfered with airflow), the Drake and Tasman Passages starting to open, as well as the lowering of greenhouse gases etc allowed for a rapid expansion of high latitude ice sheets. This would have lowered the sea levels considerably, allowing more land to be exposed which would have further affected the Earth's Albedo. This affected temperatures and precipitation patterns even more, creating feedback loops that reinforced the general cooling trend. Climate and weather patterns were no longer homogeneous and more variation in temperature extremes developed. The Late Miocene represents a transitional phase between the Eocene greenhouse climate and the Quaternary icehouse situation. Ice had begun accumulating at the South Pole during the Late Eocene (approximately 37.2 to 33.8 Mya) culminating in the Pleistocene ice age. The widespread glaciation of Antarctica and the associated shift toward colder temperatures near the Eocene/Oligocene boundary (approximately 34 Mya) represents one of the most fundamental reorganizations of the global climate system recognized in the geological record (DeConto & Pollard, 2003). Concordantly, the atmospheric circulation pattern also changed (Broccoli & Manabe, 1992) and the climatic conditions in the region of Patagonia were strongly affected. Several mechanisms were connected with Oligocene cooling, including changes in continental distribution (Barron, 1985), plateau uplift (Kutzbach et al., 1989; Hay et al., 2002), oceanic gateways (Sijp, England & Toggweiler, 2009), and the decrease of atmospheric CO2 (DeConto & Pollard, 2003). Scher & Martin (2006) suggest that the Drake Passage opened before the Tasmanian Gateway, implying the late Eocene establishment of a complete circum–Antarctic pathway. However, note that Cavallotto et al. (2011) considered that the Tasman path opened before. The Antarctic Circumpolar Current thermally isolated Antarctica, leading to the growth of the Antarctic Ice Sheet. Toggweiler & Bjornsson (2000) suggest that this opening reduced the poleward heat transport in the high-latitude Southern Hemisphere cooling high-latitude surface temperatures by several degrees (in the range 0.8–4 °C). Not the answer you're looking for? Browse other questions tagged science-based climate earth weather prehistoric-times or ask your own question. How could life evolve when exposed to high temperature? What would the weather be like on a flat dome world? In a world where two enormous cities are built one on top of the other, what would weather be like in between? Sea pumps to create rain using windmills to control weather?